Rents are flatlining in many Midwestern markets, spurring owners to look for other avenues to achieve yield. From concessions to infrastructure to small investments in tech, developers and property managers are pulling out all the stops to reach their revenue growth goals. In a market with flat rent growth, technology can be both a revenue generator and a cost-saver. IOTAS founder Scé Pike said good tech packages are leading to $45 rent bumps at Class-B assets for every $500 to $600 in investment, which she believes is a smarter investment than concessions. 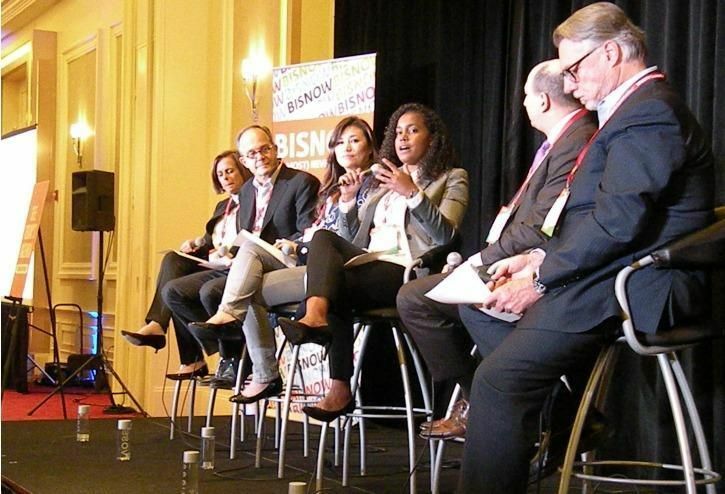 With technology trends, Pike, speaking at Bisnow’s BMAC Midwest conference, said owners need to be mindful of how a specific tech will scale and integrate with other technologies over time. CRG Director of Multifamily Brittani Sanders said tech allows owners to consider not staffing buildings full time. Hard costs and land costs are not decreasing and anything on the operational side to reduce costs makes it easier to get a deal done. Artificial intelligence technology like Alexa has the possibility to control everything in a unit. Mary Cook Associates founder and President Mary Cook said tech can be used to monitor peak usage times for fitness centers or when to have a cocktail party, which can save on property management costs over time. But the tech investment can start with simple improvements. Cook said the top reason why renters do not renew leases is unreliable internet connectivity. “If you can measure something, you can improve it,” Cook said. Pike said developers need to be proactive in collecting data, as she believes that it will be a bigger revenue generator than rent, a decade from now. Developers should be working to monetize the data they collect instead of letting Amazon and Google do it. “Put in the right infrastructure, work with the right partners and think about your future,” Pike said. But infrastructure is expensive. “Everything these days is a deal cost,” Shapack Partners CEO Jeff Shapack said. Available power and transportation infrastructure are the biggest hurdles to maintaining momentum in emerging areas like Fulton Market. Sterling Bay Director of Development Services Erin Carbonargi said city programs like the neighborhood opportunity fund are great vehicles for addressing infrastructure deficiencies without breaking a development budget. Still, Related Midwest Vice President Jacques Sandberg said it is hard to build midmarket multifamily because of costs these days and the push to pass a tax bill before the holidays will tighten margins further. The possible elimination of historic tax credits and eliminating Section 118 of the tax code would impact future Fulton Market development and projects like Related’s Lathrop Homes redevelopment. Sandberg said everyone should be concerned with the possible elimination of Section 118, which allows tax increment financing to be brought in as a match for funding. Losing that ability would have an adverse impact on development and job creation. One way for owners and brokers to stay ahead of the revenue curve when rents are not rising is to boost occupancy. For apartments, that can mean building larger footprints, as renters stay longer and pay more for those units. Fifield Cos. CEO Steve Fifield said his new Gold Coast development, The Sinclair, is at the front of that trend with an average apartment footprint of 1K SF. The median age of renters at Fifield properties eight years ago was 26-28 years; today that age is 32-35 years. Fifield said one of the biggest sectors of job growth in Chicago is an increase in day care centers. Luxury Living Chicago Realty CEO Aaron Galvin, whose firm is leasing the Sinclair for Fifield, said the units renting the quickest are the 1,400 SF two-bedroom units. But Galvin is not sure how deep the demand for larger apartments runs, and there is still a deep inventory of convertible and one-bedroom units in battleground markets like River North and the South Loop. Maintaining strong social media and investing in improving online reviews of assets can also help occupancy. Galvin said renters have a wide range of rental options and their first stops for searches are sites like Zillow, but they become confused quickly when those companies flood a renter’s inbox with listings from other neighborhoods. How quickly a broker gets back to a renter determines whether a lease is signed. “Setting expectations and giving a renter the access for a tour of a unit is important,” Galvin said. With many buildings having nearly identical amenities packages these days, Murphy Development Group’s John Murphy said the buildings that perform the best as the market softens will emphasize high-touch amenities driven through concierge-style services. “It’s the only way for developers to remain competitive,” Murphy said. This will be more costly for building owners, but Murphy sees this as the only way to stay competitive with a limited supply of renters. KTGY Planning + Architecture principal David Kennedy said concierge services will be one of three in-demand amenities moving forward, along with walking paths and pet amenities. Kennedy said there is not much difference between the needs of baby boomers and millennials, the two demographics driving leasing. With mixed-use buildings, Kennedy said the right tenant can make or break a building. Residential tenants care about the retailer in their building and a retailer like a restaurant or high-end service retail can make a building a landmark. Marquette Cos. President Darren Sloniger shared a tactic that has worked in Houston: a restaurateur is providing poolside service to tenants, hosting pop-up brunches and carryout service.